There is more to pearls than meets the eye. They are the only gem produced by a living organism. The oldest and simplest gems, pearls are like haiku: they offer infinite creative possibilities within simple parameters. Pearls have been the favorite adornment of queens and czarinas, movie stars and socialites, yet they are the least ostentatious of all jewels. Mikimoto is uniquely positioned to offer its clients an alternative to grandstanding jewelry and, since Hoffman took the helm of its North American and Russian operations in 2003, the company has enjoyed impressive growth and visibility, here and around the world. An experienced veteran of the luxury goods industry, Hoffman explains that one of the challenges of running a company with a history like Mikimoto involves balancing the traditional with the avant-garde. perfect and patent the process for culturing the radiant Akoya pearls connoisseurs crave, Mikimoto is one of the most famous and most revered names in Japanese commerce, and Kokichi Mikimoto, a brilliant inventor, industrialist and marketing genius, is as towering a figure in Japanese business history as Henry Ford or Thomas Edison is in America. While still producing its timeless designs, Mikimoto recently hired designer Giovanna Broggian to add a fresh infusion of Italian vivacity and dolce vita to the revered Japanese company. 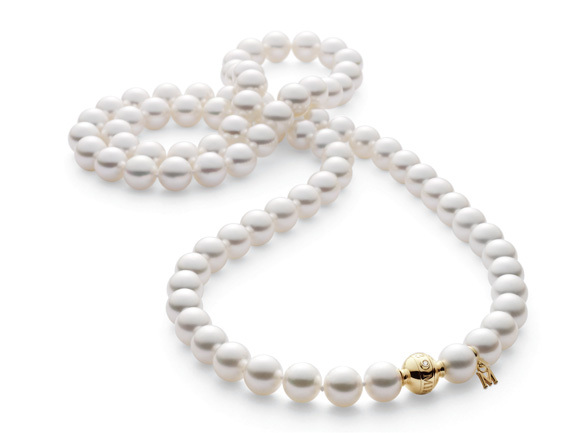 With her “Milano” collection, Giovanna Broggian has added sculptural metalwork in contemporary, satin-finished gold to the Mikimoto design mix, introduced diamonds and colored stones as accents to some designs, and combined huge, South Sea pearls with ultra-modern elements. Photos Courtesy of Mikimoto America Co., Ltd.